This gorgeous Large Conquer Frame lock Serra has the finest details and highest quality you will find anywhere! Large Conquer Frame lock Serra is truly remarkable. 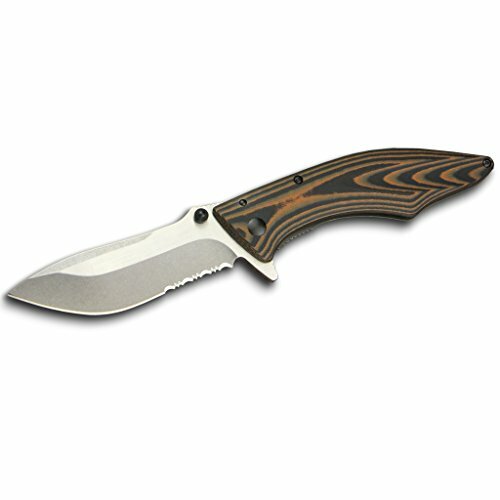 Product Details: Condition: Brand New Item SKU: SS-BRK-OECQ35S Information: Closed: 5"; Blade: 3.5" l 8Cr13MoV Stainless l Partially Serrated Edge; Handle: Brown; Other Info: Extended Tang l Pocket Clip l Thumb Ridge l Thumb Stud(s). Satin and stonewash finish blade. Brown and black MI carta front handle titanium coated 420J2 stainless back handle. Boxed.